In one of the symposia we return to Volvo’s Uddevalla plant, ‘twenty years after’. The objective of this symposium is to discuss the influences of Reflective Production, implemented by Volvo in its Uddevalla plant, on the industry and on labour process research. Through a holistic approach of learning, work and cooperation and parallel work stations, allowing two workers to assemble a whole car in four hours, the reflective production had begun to reverse the process of intellectual division of labour and to achieve performances at least equal to those obtained in assembly lines. In the 90’s, Volvo renounced to pursue in this way. But some aspects of reflective production were adopted by other companies, especially in Japan. Do we know better today the reasons for the development and subsequent abandonment of Reflective Production? What was and is the importance of labour market conditions, employment relations, worker qualifications, management styles and even individual managers, the role of engineers, trade union strength and strategy, the factories autonomy or integration in production networks, brand strategies? In other terms, what are the conditions of viability of Reflective Production? Are they specific to the Swedish context or is it possible to find them elsewhere? The panelists, who are actors and researchers in the field, will propose their analysis developed over the last twenty years. The participants come from France, Germany, Japan and Sweden. You will find more on the symposium in the Programme Book. Some of the participants in this symposium contributed to a book that may serve as a background to the discussions: Enriching Production. 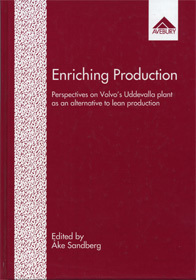 Perspectives on Volvo’s Uddevalla Plant as an alternative to lean production, Avebury 1996. The book may now be downloaded for free at freyssenet.com or at www.akesandberg.se Michel Freyssenet is one of the organizers of this symposium, together with Anders Boglind. On Michels site alone Enriching Production has beend downloaded 8.000 times. Note: Remember you may subscribe to new blog posts by clicking the orange RSS button on the top of this page.